U.S. primary election math pundits are now calculating that Bernie Sanders cannot win the Democratic Party presidential primary contest. His impending demise, and indeed his Democratic Party candidacy itself, has sparked a wide-ranging discussion and debate in the U.S. socialist movement, and in broader circles, that reveals an extraordinary level of confusion and disarray. The spectacle of most U.S. socialist organizations’ supporting, in one form or another, an open Democrat is a sure sign of a left in crisis. Including 53.5 percent that he won on May 3 in Indiana and his 51.4 percent in West Virginia, in which he actually lost ground in his race with Hillary Clinton, Sanders now needs more than 65 percent of all remaining pledged delegates for a pledged convention majority and 82 percent of all remaining delegates—including super-delegates. The latter have been handpicked by the Democratic Party hierarchy and pledged long ago to vote for Clinton. Any illusion that these lifelong professional ruling-class politicians will accede to the “popular will” and shift to Sanders is absurd. But promoting this illusion is Sanders’ current bait-and-switch tactic. It is not the math of the matter, however, that motivates Sanders to “fight on.” He clearly explained his views in a recent KQED National Public Radio (NPR) interview: “I think we are perpetuating the political revolution by significantly increasing the level of political activity that we’re seeing in this country. I think it is good for the United States of America and good for the Democratic Party to have a vigorous debate, to engage people in the political process” (emphasis added). Following four primary contest losses to Hillary Clinton in late April, Sanders insisted that even if he lost the nomination he would fight for his delegates to have substantial convention representation on the Democratic Party’s “Platform Committee,” where party leaders supposedly would hammer out the program to be implemented should Clinton win. Only the most naïve in politics believe that ruling-class policies are decided by a handful of delegates cloistered in the backrooms of party conventions. Sadly, however, most of the U.S. socialist left believe that the Sanders campaign represents some sort of “political revolution” that merits their support—in one form or another. We shall review this almost bewildering phenomenon shortly. Sanders, despite his protestations to the contrary, has been a welcome addition to the periodically orchestrated “lesser evil” sham employed by ruling-class leaders and their ever calculating and sophisticated think tanks. They know full well that capitalist elections are essential to maintaining the myth of democracy, on the one hand, and to dissipating the anger and hatred at its inherently anti-working class, racist, and sexist policies into safe electoral channels, on the other. Well before Sanders proclaimed his “democratic socialism,” national polls—the Pew polls of three years ago, for example—indicated that socialism was on the minds of millions. In a recent Pew poll, 49 percent of youth 30 years old and under preferred socialism over capitalism. Three years ago, the figure was 46 percent who preferred capitalism over socialism. The figures for the Black population as a whole were higher, with a significant majority, 55 percent, preferring socialism—in their view a more egalitarian and less predatory society, in which human solidarity and social welfare trump the greed of the elite one percent. Hillary Clinton and her advisers understand shell game politics just as well, as demonstrated by their efforts to remake one of capitalism’s most heinous warmongers and racist apologists into the feminist, humanist, anti-racist, and environmentally concerned politician they are projecting as Clinton’s campaign image today. As we go to press [May 11] a nervous Clinton has moved another step to the “left,” according to the New York Times, by embracing in part Sanders’ single-payer “Medicare for all” proposal. In due time, we will all “feel the Bern,” or better, witness the “fizzle,” when Sanders, as promised, stumps the nation hustling votes on Clinton’s behalf to save the nation from the “greater evil”—Donald Trump. Step one in the current two-stage “lesser-evil” game was Sanders’ shepherding growing and undeniable anti-capitalist sentiments back into the Democratic Party. Step two now includes Sanders’ making every effort to do the same with those who have been hornswoggled into his orbit but might yet decide to quit the electoral shell game in disgust with the thought of voting for Clinton. The fact that capitalism’s media pundits felt compelled to lend an air of legitimacy to Sanders’ fake socialism is an indication of the questioning nature of our times and the deep discontent that is percolating in the consciousness of working people. A New York Times/CBS News poll last November indicated that some 56 percent of registered Democrats who were questioned said they felt positive about socialism as a governing philosophy. Twenty-nine percent had a negative view. This, in itself, goes a long way in explaining why Clinton, and in fact, most Republican Party candidates, largely refrained from the red-baiting tirades that have been the usual stock-in-trade of capitalist politics. Attacking Sanders as a socialist might well have the effect of advancing his credibility, not to mention socialism’s! In time, when the inevitable and broad-ranging fightback takes shape in forms truly independent of and against the twin parties of capital and its liberal “third-party” middle-class-based variants like the Green Party, working people will find genuine political avenues and mass organizations of struggle to express their disgust at capitalist austerity and social regression. This combination of renewed and massive mobilizations in the streets, in reinvigorated and democratically led union fightbacks, and in anti-racist, anti-sexist, anti-homophobic, and pro-environment struggles will undoubtedly find an expression in the political arena. But this magnificent and longed for “music of the future,” based on the deeply felt rejection of the system of two capitalist parties, to be effective—to mark a clean and qualitative break with the endless variations of “lesser evilism” that are consciously presented by the most sophisticated practitioners of capitalist politics—can only be grounded on the foundation of working-class independence. The desire for political “independence,” however vague this term might be, is today gaining ground in the United States. A full 43 percent of the electorate, according to a recent Gallop Poll, is registered as Independent, with Democratic Party registration at 32 percent, and Republican Party registered voters at 23 percent. These facts alone explain why in states like New York, where registered independents are excluded in the primary process, Hillary Clinton’s margin of victory over Sanders was quite significant. In states with an “open primary,” that is, where “independent” voters can participate, Sanders is expected to win a substantial, but still insufficient majority, as in the June 7 California primary. Of course, none of these registered voter statistics tell the full story since some 51 million voters, about 25 percent of the eligible electorate, are not registered. Further, the actual percentage of all eligible voters who vote stands at 55 percent! The vast majority of non-voters are Black, Latino, and youth more generally, many of whom are consciously excluded due to reactionary legislation or are disillusioned with the entire electoral charade. There is no doubt that Sanders’ “political revolution” and “anti-establishment” rhetoric, not to mention his self-proclaimed “democratic socialism,” has captured the imagination of and spiked interest in the current primary contests as well as in socialist ideas more generally. Indeed, this is precisely and, again, the consciously orchestrated Sanders project; the U.S. ruling class and its pundits are more than capable of appealing to the best instincts and highest aspirations of working people for a better life for all in order to once again lure them into their life-extinguishing anaconda-like institutional clutches. Among these socialists, and perhaps the most prominent, is Sanders’ supporter in the primary contests, Kshama Sawant, and her Socialist Alternative party. Sawant is a two-time winner in recent Seattle city-council election contests, where she ran as an open socialist and against the Democratic Party machine. Socialist Action hailed Socialist Alternative’s Seattle campaigns, and the associated Socialist Alternative city council run by Ty Moore in Minneapolis. 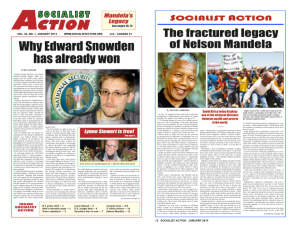 Socialist Action enthusiastically participated in these campaigns, contributed financially, organized public fund-raising forums, went door-to-door, and otherwise widely publicized this inspiring socialist effort. This is not to say that we were not aware that Socialist Alternative originally sought, unsuccessfully, to organize these campaigns as joint efforts with the pro-capitalist Green Party. But Green Party leaders rejected these overtures, leaving Socialist Alternative with a critical decision as to how to proceed. To their credit, they took the high road in working-class politics and ran as socialists, but their penchant for the middle-class Green Party was never far from their perspectives. Today, that high road, the road to independent socialist working-class politics against the Democratic Party, has been abandoned, with Socialist Alternative and Sawant actually campaigning for Sanders in all the Democratic Party primary contests. Asking Bernie Sanders, a lifelong capitalist politician with a 98 percent Democratic Party voting record, to run as a candidate independent of and against the party he has assiduously supported for his entire career is like asking the proverbial leopard to change its spots. Or better, it’s akin to yet again playing politics in the ruling class’ institutional party ballpark. Solidarity and the International Socialist Organization call on Sanders to run for the presidency as an “independent” or as the Green Party candidate. The Workers International League also speaks favorably of an “independent” campaign by Sanders. Workers World Party and the Party for Socialism and Liberation, both of which have called for votes for left-sounding Democrats in the past, including Jesse Jackson, are fielding their own presidential candidates this time around, but nevertheless have called for Democratic Party primary votes for Sanders. Keenly aware of the rapidly growing interest in socialist ideas generated by capitalism’s deepening crises and sparked by the Sanders campaign, Socialist Action branches across the country have sponsored a series of well-attended public debates where most of the above socialist organizations, as well as representatives from the Labor for Bennie campaign, shared the platform for fruitful exchanges. While the “lesser evil” syndrome was undoubtedly at work in the presentations of these socialist groups, we were heartened to see that the Marxist-grounded revolutionary socialist ideas of Socialist Action were well received and that our proud party, a consistent participant and advocate of independent mass-action united-front mobilizations against all aspects of capitalist racism and plunder, won new members to the cause of socialist revolution.